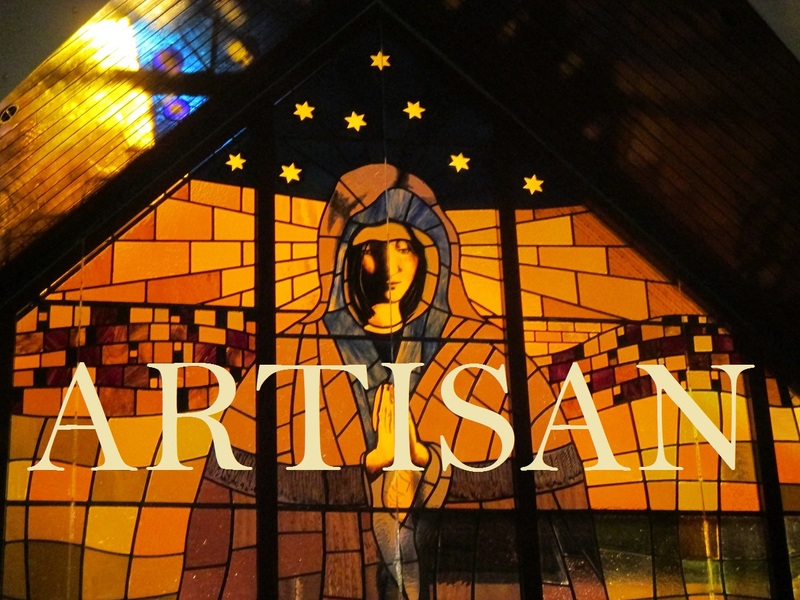 Designed by artists, hand made by craftsmen and women. Above: An entranceway designed and made by ARTISAN for a Cheshire home. 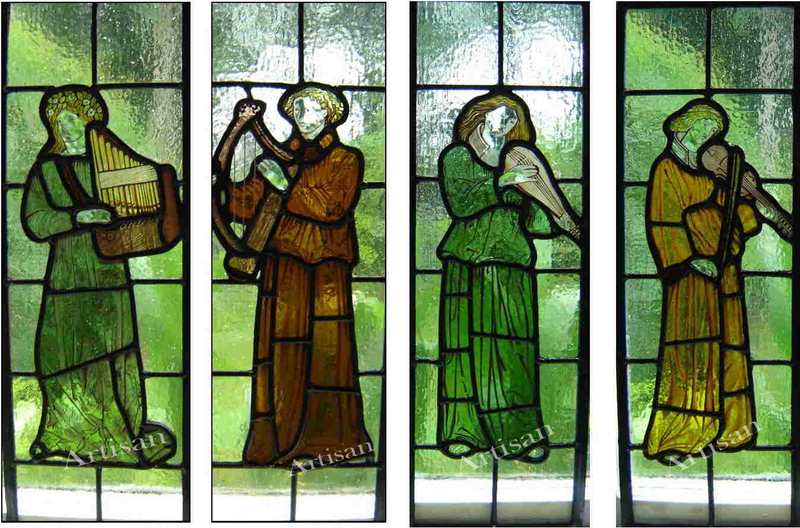 above: Minstrel windows made for a music room by ARTISAN (after Morris & Co). 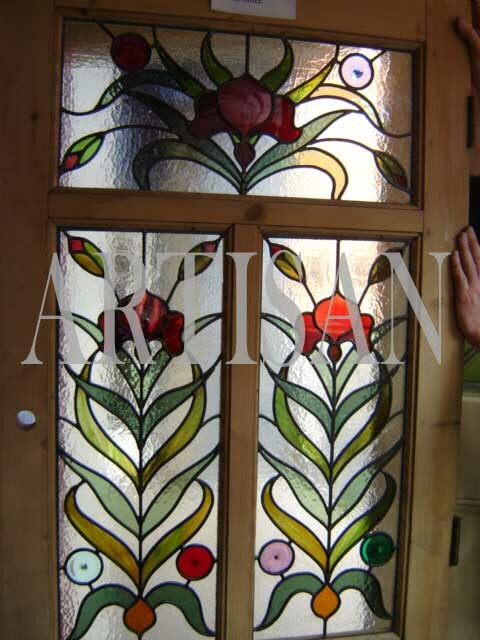 ARTISAN has been based in our Sale Town centre shop for 20years, and our experience covers over 30 years in both design and manufacture of quality stained glass. 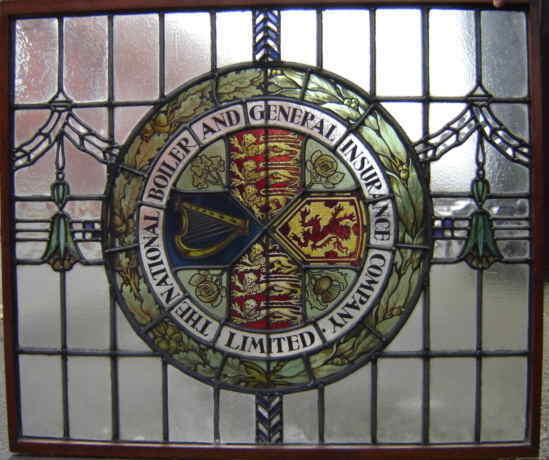 We are a company you can trust not only to design and make stained glass that will enhance your property, but also to offer a repair and restore service our stained glass customers, if the need should arise in the future. Skilled fitters are also arranged, for a complete service. 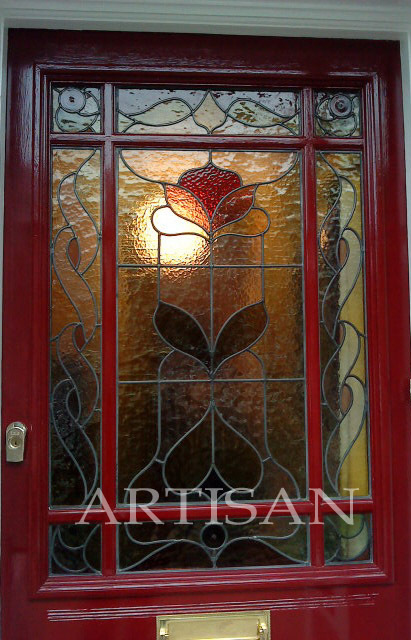 Although we can make any style of window, we specialise in Victorian and Edwardian and Arts & Crafts leaded glass, matching colours and patterns to existing panels or designing from new. The glass and lead we use to make our windows is 100% recyclable! 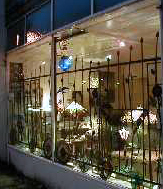 Artisan is based in Sale town centre, Cheshire, M33 next to the Town Hall, opposite the Library. Call Tom for an appointment or more info on 07976 832 323. 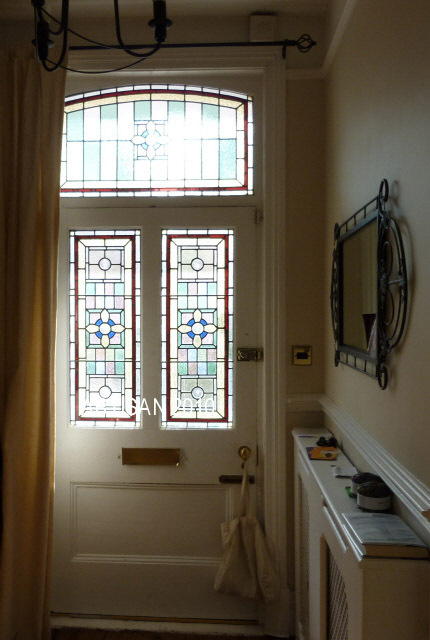 Why not transform your home with a bespoke stained glass entrance? 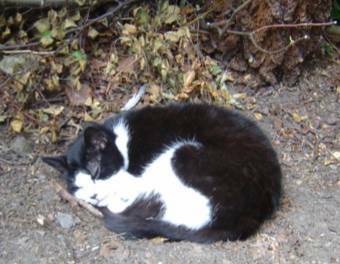 Call Tom directly for a consultation on 07976 832 323. 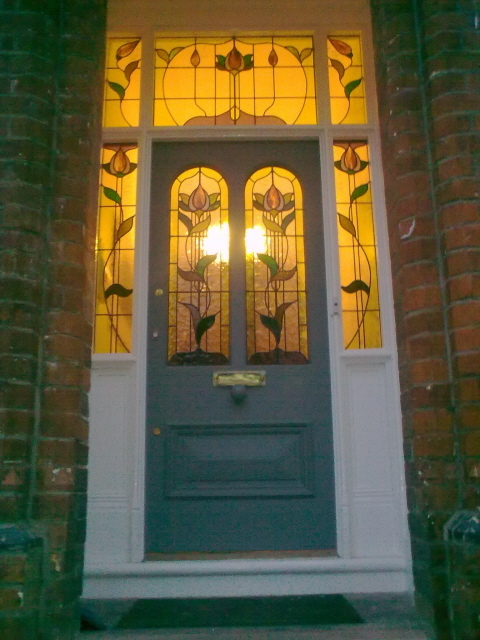 Above: A new stained glass porch in Sale, Manchester with windows designed and made by Artisan. 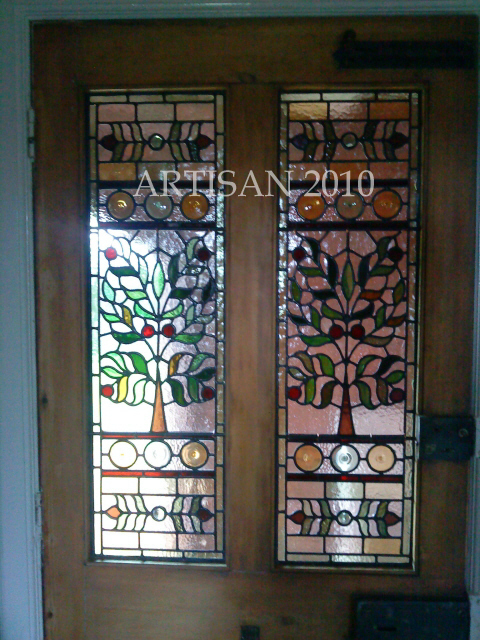 Above: Some ARTISAN dsigned and made front door stained glass. We design and make to suit your own door. Encapsulation in toughened sealed double glazed units available. 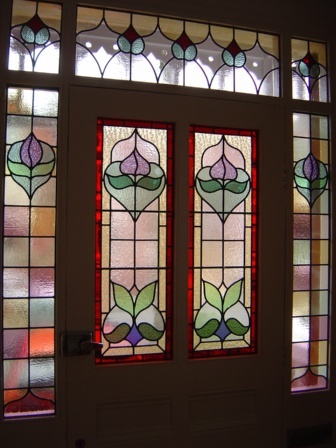 Above:Three fine examples of our own newly designed and made leaded windows fitted into reclaimed doors. 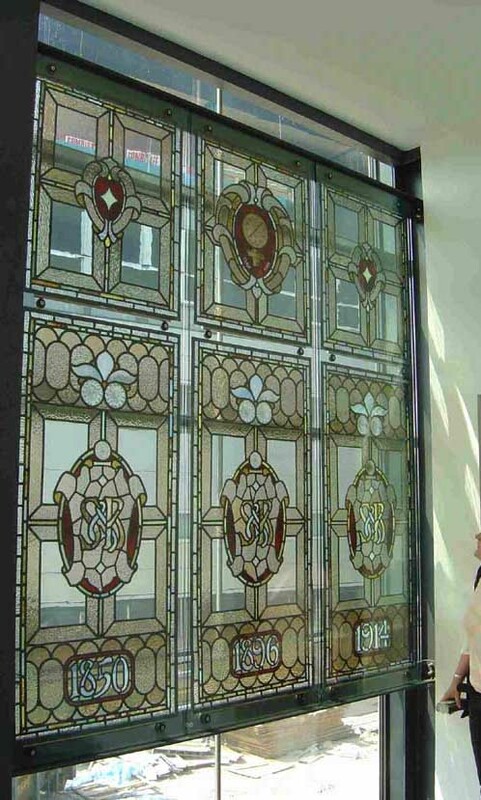 Stained glass panels can be made to your specific sizes and to fit most doors. All designs and text are copyright Artisan 1999-2019. Above: Fully restored stained glass window at St Margarets Church in Manchester, 2011. 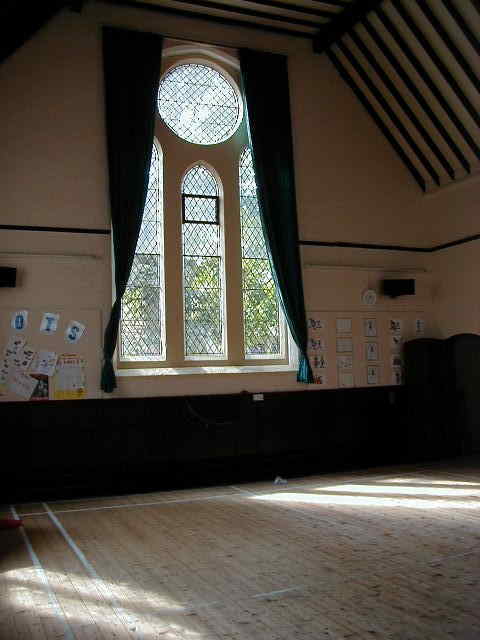 Coming soon - a page devoted to the removal and full restoration of this wonderful window, originally installed in 1959. 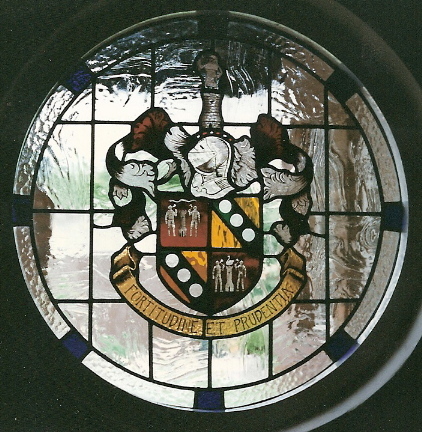 Including Masonic symbols, the general theme of the window is industry and progress while serving as a memorial to the church warden. All of the glass and lead we use to make our windows is 100% recyclable! 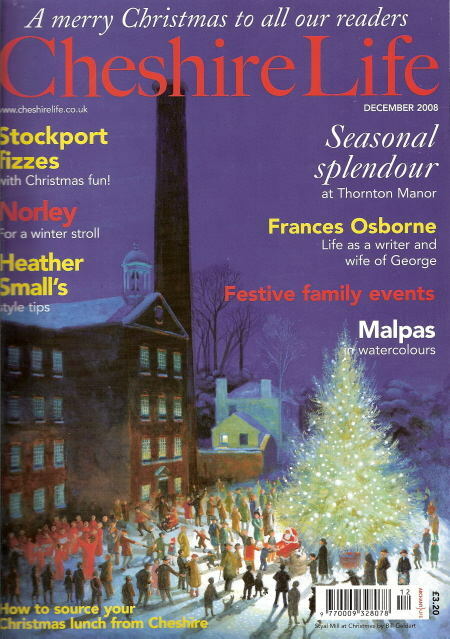 Above: A two page full colour article on Artisan appeared in an edition of Cheshire Life magazine. 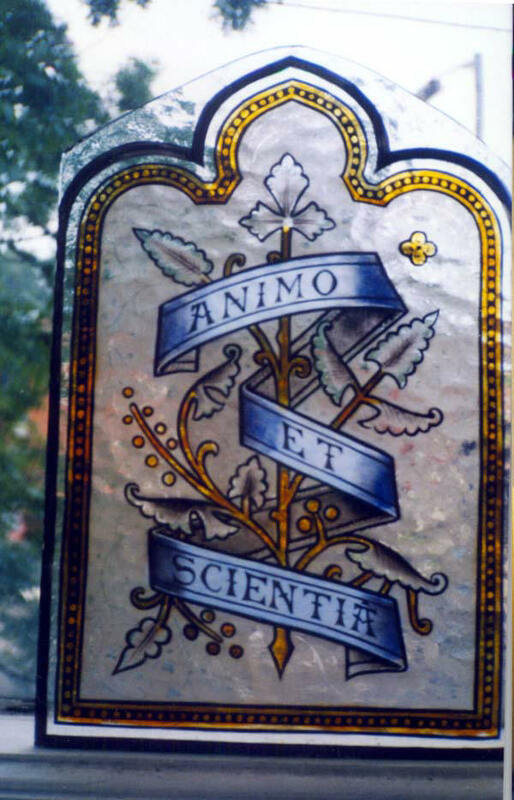 above: Painted panel restored with new painted and fired glass by our artists. 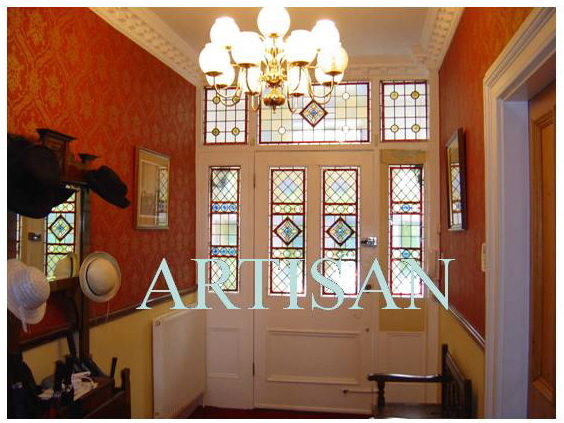 The windows above were designed and made by ARTISAN for a Victorian villa in Manchester. 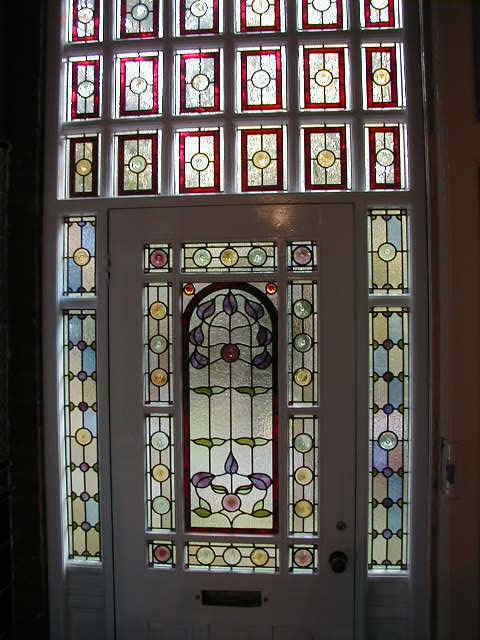 Above: Another Victoprian entranceway enhanced by ARTISAN designed and made windows in both the door and transom. .Left - A window restored by Artisan.......... ....A hand painted panel made by Artisan.......... ..The Green Man - made by Artisan. 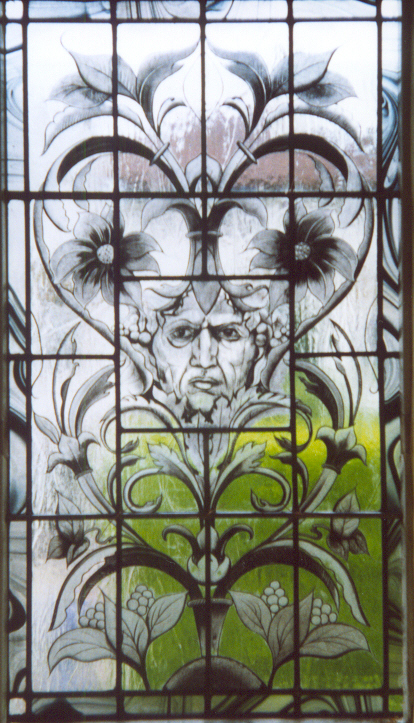 Above us -ARTISAN Green Man window designed and made in Cheshire. Our shop has glass gifts for all including one-off items of hand made glassware. Phone for opening times or to make an appointment for a stained glass consultation. Also new stock of antique lighting in the form of original Victorian hall lanterns have now arrived. Get one while you can as our collection took years to find and they can probably only increase in value as they grow harder to find. All are guaranteed original and most date between circa 1890 to 1905. 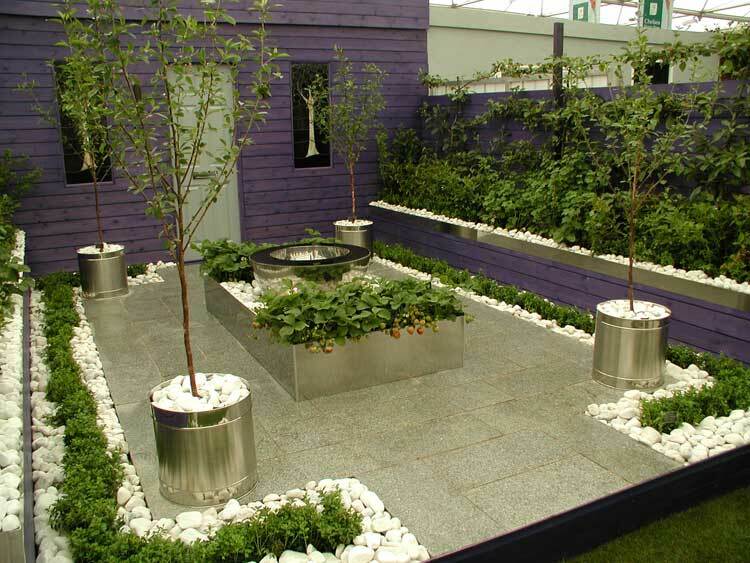 Below: Two of our leaded windows depicting fruit trees as seen on BBC TV at the Chelsea flower show, where the fruit themed garden by Classic Landscapes of Sale, won a medal.